A speech given by Yanis Varoufakis to the Gottlieb Duttweiler Institute, for International Workers' Day arguing that a universal basic income is now a necessity in our attempts to civilise capitalism. In this video former finance minister of Greece, professor of economics, author and founder of the Democracy in Europe Movement 2025 (DiEM25), Yanis Varoufakis, argues why the Basic Income is a necessity today. His arguments take into account a macro socio-economic, psychological, philosophical and moral perspective. 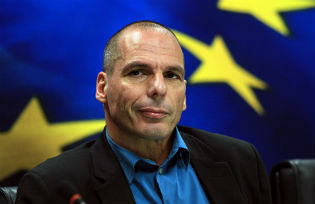 Yanis Varoufakis is the former finance minister of Greece, Professor of Economics at the University of Athens and Visiting Professor at the Lyndon B. Johnson Graduate School of Public Affairs, University of Texas, Austin. He is the author of The Global Minotaur (Zed Books). His blog is here.